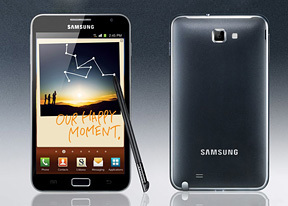 The Samsung Galaxy Note is big, no question about that. But it's about as small as possible with a 5.3" screen. There's very little bezel on the left and right of the screen (enough to let you hold it without pressing anything) and not much above and below the screen either - enough room for buttons, earpiece and so on but no more. It's fairly thin at 9.7mm but what surprised us the most is just how light it felt - the Galaxy Note weighs 178g, but spread over such a big device, it felt very light. It's not the most comfortable of gadgets to hold in one hand, but it's not that bad either. And holding it with two hands is spot on for two-thumb typing. The patterned back cover and the curved edges also helped give a positive hands-on feel to the Note. The screen merits a deeper examination, but here are the first impressions we got from it. First off, having a 5.3" SuperAMOLED is pretty cool. Graphics are smooth and you have to look close to see the PenTile matrix. Viewing angles and color rendering of the Samsung Galaxy Note are brilliant but the screen felt dim - noticeably dimmer than the Galaxy S II screen. We'll have to break out the measuring tools and investigate further to give a final verdict. For this hands-on, we won't be spending much time on the software side of things. It's a TouchWiz interface, sure, but we'd like to take more time to see all the differences and how the S Pen affects the experience. For now, here's a video demoing the Samsung Galaxy Note interface:. You can also head over to our blog to see how well the updated Exynos chipset scores on our usual suite of benchmarks.